Everyday we all are flooded with information on how to keep our bodies healthy, but what about your hair? We know about products and tools that help us style our hair to our desires, but sometime our hair just needs to breathe. So how do you know when your hair needs to detox and how do we go about it? Knowing when your hair needs to detox may save you time and money in the long run. The best candidates for hair detox are those with color, those who blow dry, or use heat often to give them the style they want. Even those that do not color their hair or use heat would benefit from a hair detox. Just like your skin your hair absorbs toxins from pollution or just from washing it. Some shampoos or products can leave residue that over time can build up and cause your hair to not have the brilliance it once did. Once you notice your hair needs to take a breather how do you go about detoxing? This includes the blow dryer. Let your hair air dry and work with your natural texture. Sometimes this can be hard, but your hair WILL thank you! If you just can not handle your natural texture try braiding your hair to give you style and help tame your hair without using heat. No one likes their roots to show, but constant highlighting sessions can take their toll on you hair. Instead try to get a root shadow with a glaze through to the ends. This will blend your roots in and save your hair another bleaching session. Try a clarifying shampoo. 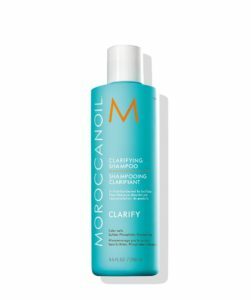 We recommend the Moroccan Oil Clarifying Shampoo. It removes build up from everyday impurities that cause dull lifeless hair and restores a weightless, healthy balance. Hydrating is important in any detox. Hair that has been damaged by heat or coloring needs hydration desperately! One of the best ways to intensely hydrate your hair is with a nourishing masque. Keune Care Intensive Hair Repair does just that! Just sleep with it in your hair overnight and wash it out in the morning, then let it air dry with some Keune Care Keratin 2-Phase Spray. Getting a Keune Bond Fusion treatment will build, enhance, and recharge our tired hair. After doing these detox steps you will see the difference. Remember these changes do not have to be forever, but by the time you detox your hair and see its natural brilliance you may not want go back to your old routine! From your team at Xhale Salon ~ Spa….Happy Detoxing!